Apple Valley Foods Inc. is one of the largest pie producers in Canada. Nothing can beat the flavour of our homemade-like pies and we are proud to share that passion with customers accross North America. Within Canada we distribute from coast to coast. In the USA, products are distributed through our parent company Harlan Bakeries Inc. of Indiana. Our top selling pies contain apples that are sourced predominately from Annapolis Valley and also from Ontario. Apples are peeled, cored and sliced on site as needed for production. Our crust is made with the finest Canadian wheat flour. Nothing could be fresher! Blueberry pies boast wild Nova Scotia berries. All fillings are made from scratch utilizing only grade A fruit. Our plant is SQF certified. Safety and quality are forefront at Apple Valley. Contact us to see if we can customize a pie program for you. 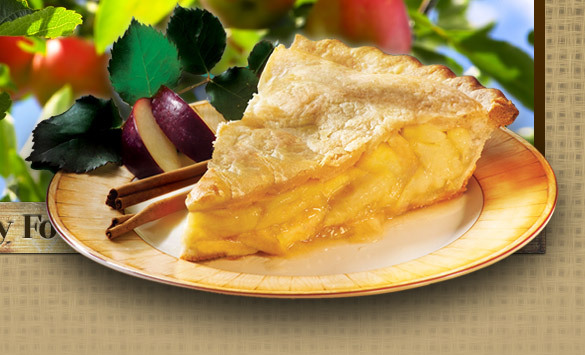 From nearby orchards to you, Apple Valley pies are made from scratch using the highest quality ingredients and "tried and true" proven family recipes.